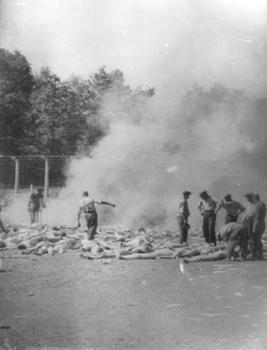 Holocaust Survivors: Photo Gallery - "Burning Corpses, Summer of 1944"
Members of the Sonderkommando at Auschwitz-Birkenau burn corpses in open pits during the summer of 1944. When the crematoria ovens were not functioning properly, or were insufficient to dispose of the huge volume of corpses, the bodies were burned and then buried in ditches. These photographs from Birkenau were made secretly by members of the Polish resistance, and several of them were smuggled to England.